It happened unexpectedly, as my discoveries of extraordinary beauty products often do. I was preparing for a Facebook Live shoot at Byrdie HQ, receiving a quick touch-up from British makeup artist Nilam Holmes Patel. After cleaning up my eye shadow and powdering my T-zone, Patel whipped out a pair of products that stopped me in my tracks: a jet-black pencil and an angular blade. Then, in our photo studio, she started sharpening like an old-fashioned woodworker, pencil shavings falling to the floor. "What on earth is that?" I asked Patel, my curiosity piqued. "Some sort of eyeliner?" "Oh no, it's a brow pencil," she responded. "It's from my line back in the UK." With the freshly sharpened point, Patel began delicately penciling individual brow hairs onto my face. Five minutes later, I looked in the mirror, and where patchy, flat brows once were, there was now a full set of feathered, runway-ready arches. I'll give you a moment to process: This was a black-as-night eyebrow pencil imported from England and hand-sharpened with a miniature custom knife, which somehow gave me the eyebrows of my dreams. It was like nothing I'd ever seen before. Instantly, I knew I had to have one. Curious? Keep scrolling to learn more about this game-changing eyebrow pencil: how to use it and how to acquire one yourself. After beholding my new brows, I grilled Patel for details. I learned that the makeup artist is the co-founder of British makeup brand High Definition Beauty, which specializes in professional-quality brow products. The one she was using was their Pro Pencil ($22), which you sharpen with the corresponding Pro Shaper ($9). "At High Definition, we can't get enough of a tame, textured, and au naturel brow," the brand told me later in an email. "Our secret: We believe in using makeup to fake the effect of real hairs, so whether you have full or delicate brows, with a little filling in and TLC, no one will know the difference." According to the brand, the key to this perfect brow is precision: "The precise application of the High Definition Pro Pencil comes down to its specially designed angled blade, the High Definition Pro Shaper. The unique blade creates a super-fine tip, which allows you to mimic individual hair strokes in those sparse or bald areas." 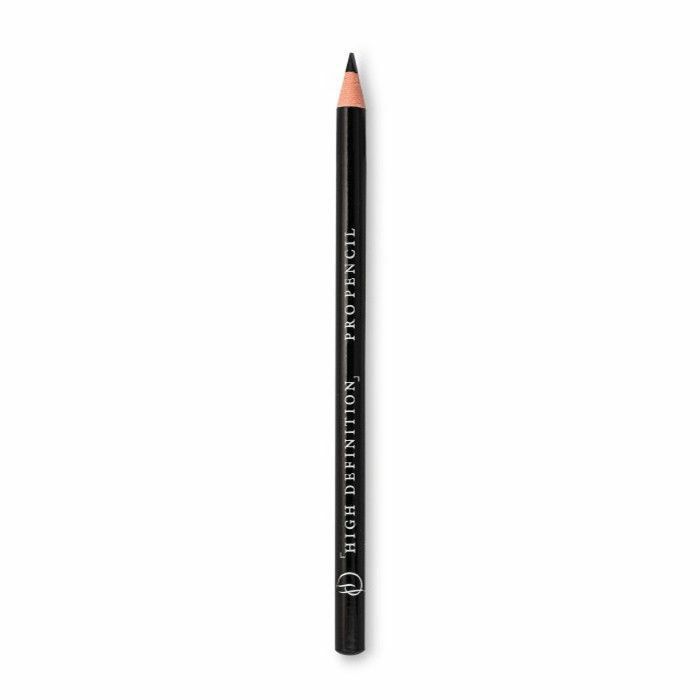 With most self-sharpening brow pencils, you simply shade in the whole brow area. But this ultra-fine pencil makes it possible to get detailed. In a sea of magic markers, it's a fine-tipped pen. My brows are straight across in shape and totally natural. (I haven't so much as tweezed them in a year.) But there are still areas where my brows aren't as full. Plus, I love the look of those feathery, Brooke Shields "sprouts," an effect you can't create with most brow pencils. But with High Definition's, you can. I won't lie—wielding this brow pencil like a pro takes practice. You have to get used to using light, steady flicks to create the individual brow hairs. And it's important that you sharpen the point so that it's as fine as possible, or else the hairs will look thick and artificial. As the brand advises, "Feather the appearance of hair strokes lightly through the brow and only in areas that need filling." And don't brush through afterward with a spoolie, or all your hard work will smear. But after a few practice rounds, you'll hit your stride. Thanks to this discovery, I now have access to bushy, model brows whenever I want. It's not a look I go for every day, but when I want my brows to look effortlessly bold and full, I'm glad to have my secret British weapon on hand. Shop the HD Pro Pencil below (and don't forget the Shaper). Are you curious to try High Definition's Pro Pencil and Shaper? Tell us your thoughts in the comments below!